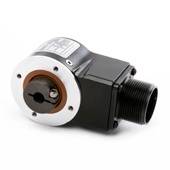 The Series HS20 Sealed Hollow-shaft encoder is designed for easy installation on motor or machine shafts. Its hollow-shaft design eliminates the need for a flexible shaft coupling, mounting bracket, flower pot, or flange adapter. The Dynapar brand Series HS20 Sealed Hollowshaft encoder is designed for easy installation on motor or machine shafts. Its hollowshaft design eliminates the need for a flexible shaft coupling, mounting bracket, flower pot, or flange adapter. This not only reduces the installation depth, but also lowers total cost.